Space shuttle Atlantis successfully touches down at Kennedy Space Center on Feb. 7 2008 at 9:07 a.m. EST. This story was updated at10:09 a.m. EST. CAPE CANAVERAL, Fla. - Theshuttle Atlantis and seven astronauts landed safely back on Earth Wednesdayafter a successful mission to deliver Europe?s first permanent orbital laboratoryto the International Space Station (ISS). 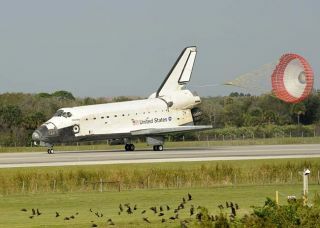 With shuttle commanderStephen Frick at the helm, Atlantis swooped out of the morning sky over NASA?sKennedy Space Center (KSC) here and loosed two sonorous sonic booms beforetouching down at 9:07 a.m. EST (1407 GMT). The shuttle?s return cleared the wayfor the U.S. military to shoot down afalling spy satellite the size of a bus. ?It's been a great mission,? Frick saidafter landing. "We're extremely happy to be home and it's a great day in Florida. We can't wait to see our families." Frick and his crew ferrieda new crewmember to the station during their 13-daymission. They also delivered the European Space Agency?s (ESA) Columbuslaboratory, a 1.4 billion euro ($2 billion) research module that representsEurope?s largest contribution to the ISS project. Returning to Earth aboardAtlantis with Frick were shuttle pilot Alan Poindexter, mission specialistsLeland Melvin, Rex Walheim, Stanley Love, Dan Tani and German astronaut HansSchlegel, representing the ESA. Frenchastronaut Leopold Eyharts launched with Atlantis? STS-122 mission,but stayed aboard the ISS after relieving Tani as a member of the station?sExpedition 16 crew. ?We could be the example ofhow to tackle bigger problems in the future just in international cooperation,?said Schlegel, who sat out the first of the STS-122 mission?s three spacewalksdue to an illness but bounced back in time for the second excursion. ?It?s agood feeling to do that.? Atlantis landed aftercircling the Earth 202 times on a trek that covered about 5.3 million miles(8.5 million km). Aside from Schlegel?s sickness and a few other minorglitches, the mission ? NASA?s first shuttle flight of 2008 ? went smoothly. ?It?s certainly been anawesome, great display for both teams, the shuttle and space station programs,?said NASA?s LeRoy Cain, chair of Atlantis? STS-122 mission management team,before today?s landing. ?It?s arguably one of the most successful dockedmissions that we?ve had.? Wednesday?s successfullanding gives the U.S. military a clear shot to launch a missile at a deadreconnaissance satellite from a Navy cruiser in the Pacific Ocean. Pentagonofficials pledged to wait until Atlantis was safely home before destroyingthe out-of-control spy satellite to avoid endangering the public on Earthwith the spacecraft?s toxic half-ton load of hydrazine rocket fuel. Europe?s Columbus lab is a10-ton cylinder that added a new 23-foot (7-meter) long room to the ISS. Themodule?s arrival also marked the activation of a new Mission Control centernear Munich, Germany, where flight controllers now oversee the new laboratory24 hours a day. ?I consider it thebeginning of manned spaceflight for Europe,? Schlegel said during the mission. ?We have the opportunity to do experiments around the clock, all year.? Eyharts will spend the nextmonth activating a set of science experiment racks inside Columbus while flightcontrollers commission two external payloads installed by Atlantisspacewalkers. ESA officials are also gearing up to launch Jules Verne, theagency?s first Automated Transfer Vehicle cargo tug, to the ISS in early March. Atlantis? STS-122 missionis NASA?s first of up to six shuttle flights ? five of them aimed at ISSconstruction ? planned for 2008. The shuttle landed just days after its sistership Endeavour reached the launch pad for its own STS-123 mission, which is setto launch on March 11 to deliver the first segment of Japan?s Kibo laboratoryand a two-armed addition to the station?s robotic arm. NASA hopes to launchAtlantis again in late August on the final mission to overhaul the Hubble SpaceTelescope. The shuttle set down Wednesday 46 years to the day NASA launched itsfirst-ever manned orbital flight, with Mercury astronaut John Glenn circlingthe Earth three times before landing to conclude the third manned U.S.spaceflight. For Tani, Wednesday?slanding marked the end of an extended spaceflight that began in late Octoberand ran about 120 days. Delays to Atlantis? planned launch in December extendedhis flight by two extra months, during which time his mother Rose was killed ina car accident. ?I?m very honored to begiven an opportunity to do all these wonderful things,? Tani said as he leftthe ISS, calling his mother his ?inspiration.? ?I feel like I should havecherished them more as we were doing them, so a little regret.? In addition to reunitingwith his wife Jane and young daughters Keiko and Lilly, Tani said he lookedforward to reacquainting himself with gravity. He worked out on a treadmillaboard the ISS and returned to Earth in a reclined position to ease hisreadjustment. ?I think that being in agravity environment is going to play havoc on my vestibular system like italways does for most people, and I?ll just have to deal with that,? he said. Before leaving the ISS,Tani recollected a day during the joint mission when he floated between thestation and Atlantis toting a video camera to find crewmates exercising andperforming experiments while other astronauts were busy spacewalking outside. ?It was almost like apromotional video,? he said. ?And I thought, 'We're almost there.' We're doingscience, we're building huge construction projects, we're doing [spacewalks] ?it?s just amazing.? NASA is broadcastingAtlantis' STS-122 mission live on NASA TV. Click here for SPACE.com'sshuttle mission coverage and NASA TV feed.